UFC middleweight champion Chris Weidman will put his belt on the line again at UFC 187, against another Brazilian foe, this time in the form of former champion and MMA old school legend Vitor Belfort. ‘The Phenom’ crushed his way through the top flight in 2013, earning three consecutive knockout wins. Now ‘The All-American’ will look to add another scalp to his growing collection, and another former champ at that. “Fight night. 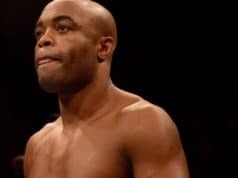 He came out as vintage Anderson Silva, taunting and making jokes. It was just his act, and I knew it was just that — an act. Whether we were on the ground of standing, I tried to land as many big shots as possible. I wanted to let him know I wasn’t scared. I was there to fight, and I was there to win. I was there to finish him. I was landing shots, and he was just sitting back, putting his hands on his hips and asking for more. I wanted to let him know I wasn’t scared. I was there to fight, and I was there to win. I was there to finish him. So I gave it to him. I stuck to my gameplan and kept on coming. Just before the first round ended, I landed another punch, and when the horn sounded, Silva came in, put his arm around me and kissed me on the cheek, then he went back to his corner and kept on talking. He was really putting on a show, but it didn’t get to me. I was there to fight. I came out fast in the second round and Silva came out clowning. About a minute in, I connected with a left hook, and he wobbled his knees, pretending to be hurt like he was gonna go down. While he was busy acting, I came back with another left. I had him off balance — for real this time — and it was the third left hook that did it. I connected with a third shot to his chin, and he went down. When he hit the floor, I jumped on him and kept coming with punches. The referee stopped it, and it was over. For almost six years, I’d been visualizing this moment. I’d been saying I was gonna beat Anderson Silva, and nobody believed me. It’s something special when you say you’re gonna do something and everybody says you’re crazy — when you tell the whole world you’re gonna finish him, and everybody laughs at you — and you go out and do it. It’s an indescribable feeling. I was the new UFC middleweight champion, but my vision wasn’t complete. 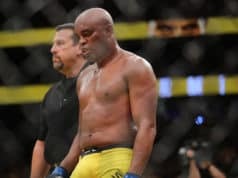 I was on a mission, and that mission was clear in my mind: I was gonna beat Anderson Silva and take his UFC middleweight title, then we were gonna have an immediate rematch and I was gonna beat him again. After the fight, one of the first things I said to him was, “We’re doing this again.” Because I had a vision, and in my vision, we were fighting twice. It’s something special when you say you’re gonna do something and everybody says you’re crazy… and you go out and do it. Once we got into the Octagon for that second fight, I felt like I was seeing everything he was doing before he even did it. I just had him down. The only thing he actually connected on during the first fight was leg kicks, so all through training, we drilled, and drilled and drilled checking leg kicks. We knew that’s what he was gonna come back with the second time around. Sure enough, just over a minute into the second round, he threw a leg kick and I checked it. He came right back with another leg kick, and this time, when I checked it, his leg snapped in half. It was ugly. 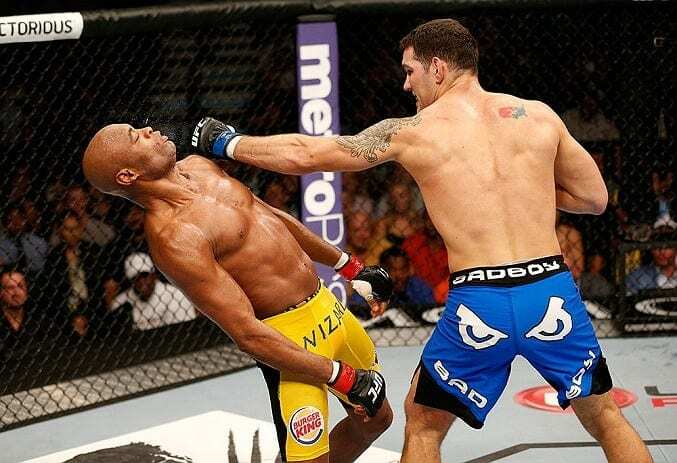 “I wouldn’t even be excited for a third fight against Silva. After winning those two fights and having beaten Lyoto Machida to defend the middleweight title since, I need competition. 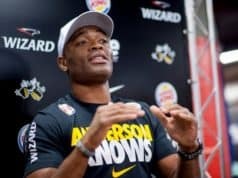 And today, it’s clear to everyone what I’ve known to be true all along: Anderson Silva will never beat me. The competitor in me instantly searches for new goals. Now, I want to clear out my weight class. I want to demolish the next guy, and the next guy and the next guy. I want to beat all the fighters people think I can’t beat. I want to retire undefeated. It just doesn’t end. Which brings me to my current focus: I want to completely dominate Vitor Belfort on Saturday. I want to make a statement and let everybody know that I’m head and shoulders above everybody else — that I dominate this weight. Once again, I have doubters. Vitor Belfort is very powerful and strong, and a lot of people think he poses a big problem for me. So I’ll just have to prove everybody wrong again. I wanna fight him, and I wanna beat him. And I can, and I will. Well, that says a lot about the middleweight champ’s mindset going in to his fight with Belfort. Obvious are his intentions, but will he put them in to practice against the ever-dangerous and explosive ‘Phenom’?